This HDMI DVI audio encoder/embedder allows users to embed a new audio feed from 3.5mm/RCA L/R or optical audio source into a HDMI or DVI signal or converting the audio output from CD player or Hi-Fi system to HDMI . 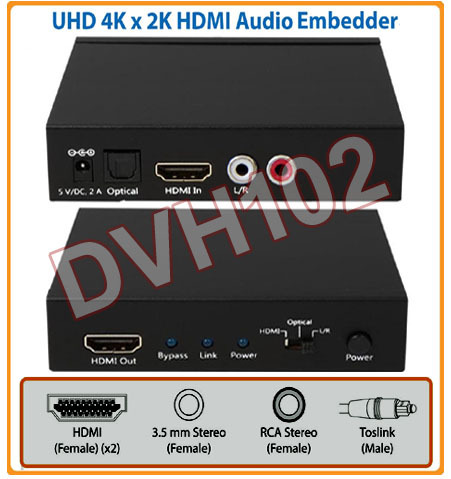 This HDMI DVI audio embedder supports 1 optical audio input, 1 of 3.5mm or RCA L/R input via adapter and a HDMI input, which is also backward compatible with DVI input. Users can select between audio input for conversion or encoding. The audio embedding process is automatically performed in real time with no lags. The HDMI input supports resolutions up to 4Kx2K pixels and pass-through of all HDMI 3D video and deep color modes. This HDMI DVI audio processor provides users with easy external ways to swap the existing digital audio in HDMI signal with different audio feed or adding audio to DVI signal or simply converting audio signal into HDMI format with no video content included. This HDMI DVI audio combiner has an easy dip switch design. Users can manually select the desired audio input source to be embedded or converted through the DIP switch on the unit. This dip switch setting helps A/V installer overcome audio issues during complex HDMI installation and offer great flexibility of selecting favorite audio for encoding and re-generating new HDMI feed for distribution, extension or integration. 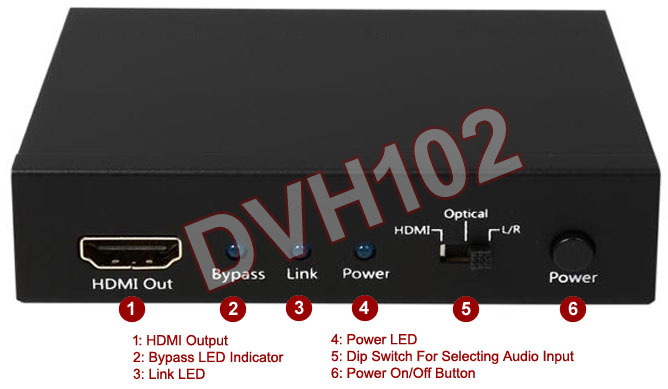 This HDMI audio encoder can also transcode only the analog stereo or digital audio signals into normal HDMI output while the video portion of the HDMI input is not required. The audio-only HDMI output from this device can still be accepted and decoded by any HDMI receiver, HDMI switch/matrix, HDMI splitter, HDTV, allowing easy integration of typical audio sources with new HDMI distribution system to work together for audio broadcasting and distribution. All analog stereo or digital surround input from RCA or optical input such as Dolby Digital 5.1, AC3, DTS and PCM 2-channel inputs are supported by this audio encoder. This device can accept audio inputs of digital S/PDIF in optical format or analog RCA L/R stereo and output them in HDMI format. It supports digital audio sampling rates up to maximum of 192kHz and analog L/R sampling rate at 48kHz. This unit can be cascaded with other HDMI devices such as HDMI switchers/splitters or HDMI DVI distribution systems for achieving larger-scale setup and for applications requiring long cable runs like digital signage, information kiosks and so on. Replace the original HDMI audio by filtering out the original audio embedded in HDMI signal and mixing with different digital audio format for studio production or broadcasting. 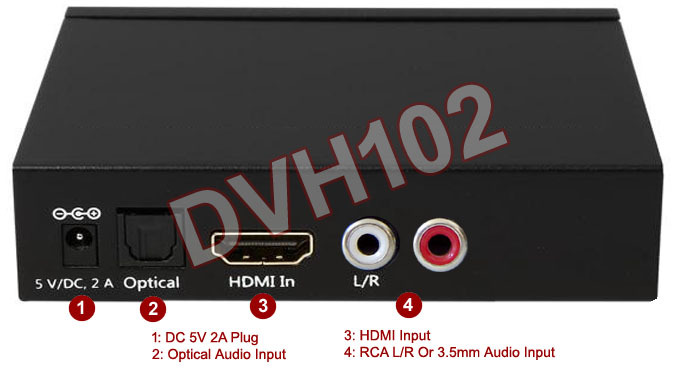 Encodes analog stereo or multi-channel surround sound into HDMI feed for new HDMI output. Combines DVI video with analog or digital audio for HDMI output further distribution. Real-time audio encoding with original sonic quality retained. No lags and no loss. Encoding optical audio of PCM 2CH, Dolby 5.1 and DTS 2CH/5.1 type input to HDMI audio for output. Encoding analog stereo from its 3.5mm input or RCA L/R input (via adapter) to HDMI for output. 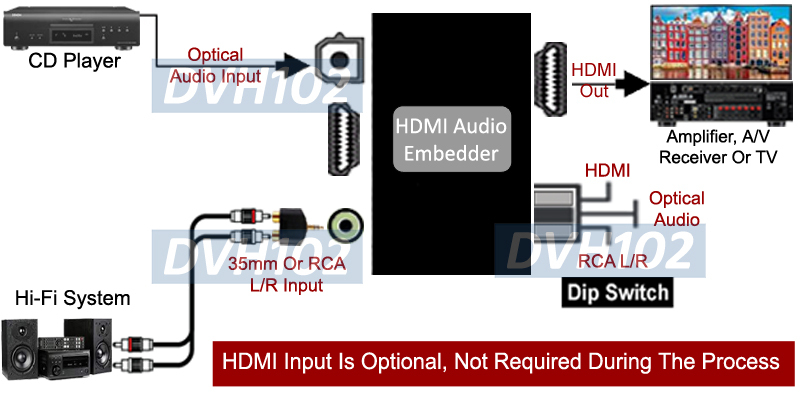 Easy dip switch design for users to choose input audio channel between HDMI, Optical or RCA L/R before encoding. The repeater function auto equalizes and compensates for HDMI/ DVI signal loss and extends the cable reach to maximum distance. Maximum HDMI extension range can be up to 15m/ 50ft for 1080p with 8-bit transmission or 10m/ 32ft for 1080p with 12-bit transmission. Can be cascaded with other HDMI devices such as HDMI switchers/splitters or HDMI DVI distribution systems for achieving larger-scale setup and for applications requiring long cable runs like digital signage, information kiosks and so on. Ideal HDMI audio solution for applications such as home entertainment, video conference, home theater, business presentation, classroom and so on.